On Sunday , Sept. 30 and Monday, October 1, 2018 three young Pro-Life were violently assaulted as they were standing in protest of abortion. The first incident which quickly went viral on social media involved Jordan Hunt roundhouse-kicking a young pro-life woman, named Marie-Claire Bissonnette. (Video below)Hunt began by destroying pro-life signage and then writing with permanent marker on jackets of pro-lifers, including a young 10-year-old girl. It was noted by the Canadian Centre for Bio-Ethical Reform that Hunt previously assaulted another young female prolifer earlier this summer in Toronto. 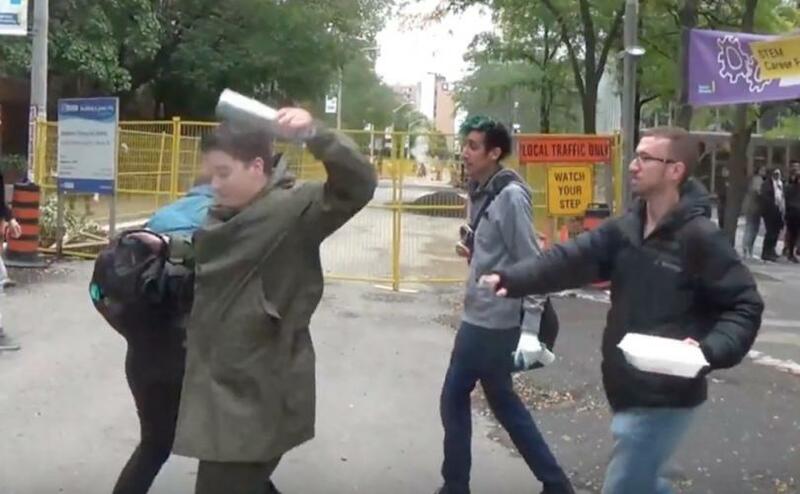 In a separate incident 2 Toronto Against Abortion team members were violently attacked while engaging in civil discussion about life at Ryerson University in Toronto. Gabby Skwarko, (in video below) who is a member of the Ryerson Reproductive Justice Collective and last year's Faculty of Arts Director at the Ryerson Students Union, was the attacker of Blaise Alleyne and Katie Somers. She approached the two from behind and launched into an attack on them and their property. Police were called. Katie Somers suffered injury, including bruising to her leg.